APC senator, Dino Melaye - while speaking on the floor of the Senate over the move to confer the honour of Grand Commander of the Federal Republic (GCFR) on late M.K.O Abiola, the acclaimed winner of the 1993 presidential election - cautioned President Muhammdu Buhari against breaching the constitution. 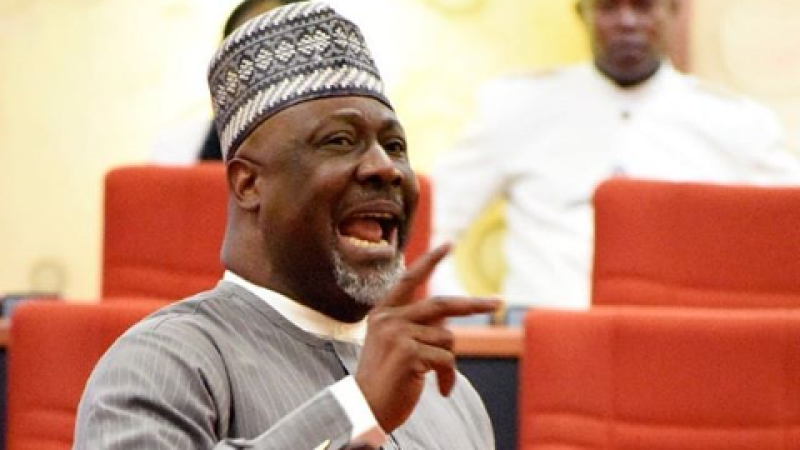 Dino, who cited Chapter 43(2) of the National Honours Act on Thursday, argued that the act does not allow for conferment of the honours the way President BihBuh has done. Dino claimed that M.K.O Abiola is dead and that automatically makes him not to be a Nigerian. He said, “I am a democrat, I believe very sincerely that Chief M.K.O Abiola deserve even more than the president has pronounced because he is a true patriot, philanthropist and should be so decorated. The lawmaker mentioned a section of the law which he claims buttresses his point. The lawmaker also argued that the act provides that such honour be conferred on the recipient in person and since Abiola is dead, he cannot receive the award; a similar argument to that raised by a former chief justice of Nigeria, Alfa Belgore. Dino said; “Subject to the next notice, a person shall be appointed to a particular rank of an order when the president receives him in person. The Senate President, Bukola Saraki, announced that Dino's point of order were noted.